Ah, Gramma. We hardly knew ye. After a strong two-year run, the Seattle-based poetry press, founded by Bill True, will close up shop by the end of this month. Editor Colleen Louise Barry, who, along with Cold Cube Press's Aidan Fitzgerald, took over for founding editor Drew Swenhaugen in January of this year, said in a press release that the publishing outfit will end due to a lack of funding. "Gramma is generously funded by the Bill and Ruth True Foundation. As the Foundation dissolves, Gramma will lose our vital financial support. Beyond this financial support is a foundational relationship with our publisher, Bill True, without whom Gramma would cease to make sense," she wrote. Bill and Ruth True are art collectors and business owners who founded Western Bridge, a beloved gallery in SODO. The space shuttered in 2012 for financial reasons related to Gull Industries, Bill's family company, but the organization continues apace. The building has since turned into Canvas Event Space. Bill True did not immediately return a phone call requesting comment. I'll update this post when I hear back. Barry is currently on the hunt for a local press willing to absorb the nine titles they've published over the last two years. "It has been a privilege to be a part of the thriving literary community in Seattle and beyond," Barry said in the release. 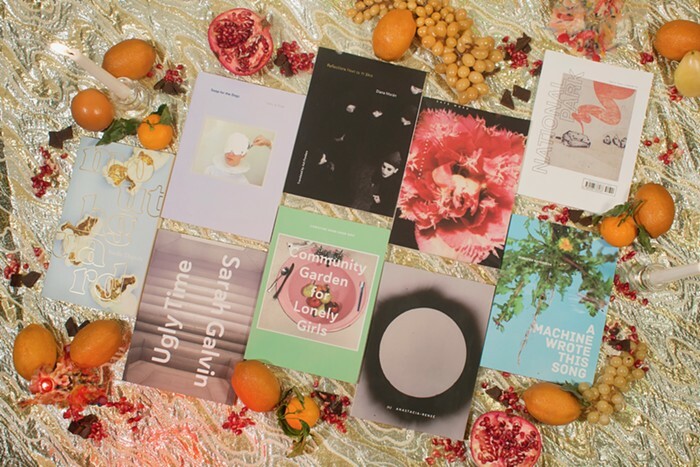 "We believe that poetry fosters empathy and can create social change, and we look forward to seeing what happens next for our authors and our own projects." Gramma wasn't just another publisher of slim volumes of poetry. Their books were art objects in and of themselves. For the first eight titles, authors picked works of visual art or sculpture to feature on the cover. My favorite was Mungo Thomson's Skyspace Bouncehouse, a massive grayscale bouncy castle that graced the cover of Sarah Galvin's terrific book of poems, Ugly Time. In one case, True bought the art the author wanted to see on the cover. The newest book, Sadie Dupis's Mouthguard, slightly broke from the same-size/same-shape formula initiated by Swenhaugen but still maintained a close connection to visual art, with an installation from Pae White floating around on its cover. In addition to publishing mind-expanding books of poetry, Gramma also threw the best parties. Thompson's bouncy castle was installed at Galvin's book launch and also her wedding, which reportedly led to many bouncy fun times. The launch party for Seattle Civic Poet Anastacia-Reneé's (v.) was a midsummer dream involving plates soul food, Anastacia's powerful and hilarious performance, Tommy Pico's hilarity, Betty Wetter's wildness, Imani Sims's moving work, and a conversation with Reagan Jackson. Neighbors watched the festivities from their balcony, and random strangers were pulled into the party as they walked by. It was really something. The press also distributed a monthly newsletter in the mode of experimental poetic magazines circulated in the early 1960s and ran a quarterly readings series. The series paired dance performances with readings by Gramma authors and good poets who weren't on their roster, such as Pulitzer Prize-winning Tyehimba Jess, Kate Durbin, and Kaveh Akbar. This is a loss for the Seattle literary scene, though chances are good that the books they published will continue to live on with another press. *This post has been updated to reflect the fact that the foundation isn't dissolving, that True only bought an art object for a book once, and that Western Bridge continues on despite the closure of the space.